A ready-to-eat hearty entree and fresh, homemade dessert. What could be better than that? Well, how about the money you'll save when you order this 7-9 lb. 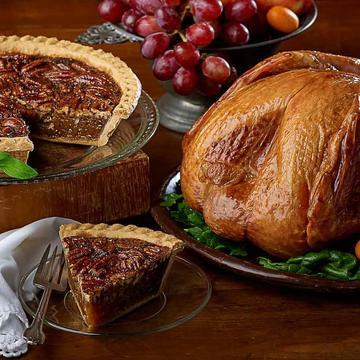 Hickory-Smoked Smokehouse Turkey and our Southern Pecan Pie in combination? What a deal!! No cooking required. Refrigerate after opening. Sugar, Corn Syrup, Pecans, Eggs, Margarine (Liquid Soybean Oil & Partially Hydrogenated Soybean Oil, Water, Salt, Soy Lecithin, Vegetable Mono & Diglycerides, Potassium Sorbate & Citric Acid as Preservatives, Artificial Flavor, Colored with Beta Carotene, Vitamin A (Palmitate) added), Pastry Flour (Unbleached Wheat Flour), Vegetable Shortening (Partially Hydrogenated Soybean & Cottonseed Oils), Water, Imitation Vanilla (Water, Caramel Color, Ethyl Vanillin, 0.1% Potassium Sorbate (added as a preservative), and Heliotropine), Salt (Salt, Calcium Silicate, Dextrose, Potassium Iodide), Baking Soda, Sodium Benzoate (Preservative). May contain traces of peanut, other treenuts, and soy.